Pond Myth #2: UV lights are the best way to keep your pond water clear. UV clarifiers are one of the ways to keep your pond water clear but certainly not the only way, and arguably not the natural way. The fact of the matter is that if you have a pond that's naturally balanced, in which the aquatic circle of life is rotating the way that Mother Nature intended, you don't need a UVC installed in your pond at all. In this naturalistic setting, the fish eat the plants, then produce waste that gets broken down (along by other pond debris) by aerobic bacteria that's colonized on the rocks and gravel below, and then it's taken back up as nutrition by the plants, continuing the cycle. A naturally balanced pond is the low maintenance pond because Mother Nature is doing the maintenance work for you. Pretty good deal, don't you think? There are several drawbacks to the UV solution though. 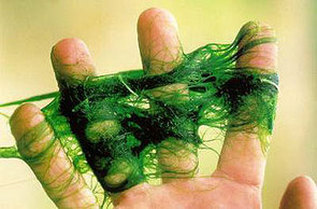 First, no matter how intense, UV clarifiers don't affect string algae at all, and so this problem is not addressed. Secondly, after the regular algae is killed, it generally falls to the bottom of the pond, biodegrades, and provides another wave of nutrition for another (often larger) algae bloom. 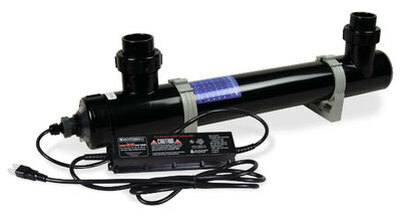 If you're not careful, it's easy to encourage larger cycles of algae blooms by using a UVC. If your pond is unbalanced, the choices are minimal. The third, and most obvious drawback is that a UVC isn't cheap, and the bulbs usually require replacement installation every season.